Preston Railway Station is to host a unique four-day arts event later this month – and we are all welcome to take part. The Oasis Social Club will open its doors on Thursday September 17 and for four days will host everything from aerobics to bingo, philosophy to pie and parched peas. The mobile touring ‘club’ is the idea of artist Rebecca Davies. It is a vibrant, temporary space, complete with a licenced bar, and aims to encourage the local communities to participate in discussions about their area while enjoying a range of fun activities and entertainment. The four day event announces the arrival of Hit the North – a new live art experience conceived and run by Lancashire-based culture agency TheyEatCulture, in residence at the train station. Like any social club, Oasis is a place to talk about matters that affect the area and the community, alongside wider discussion around what defines ‘the north’ and what it means to live and work here. Rebecca devised a fictional ‘host’ figure – ‘Our Denise’ – for the club and she will remain in character for the duration of the event. A Prestonian club president will elected, along with a committee set up to compile a manifesto for the club and for Preston. Artist Rebecca, right and above, said: ‘Our Denise has been created from discussions and workshops with the people of Preston. “What she looks, smells and sounds like has been a collaborative effort based on the requests of locals. “I am extremely excited to be hosting the club as Denise, from the heart of the city of Preston, its railway station. Activities taking place at the club include a night of local live music, bingo, a railway life drawing class, a book binding workshop, a walking tour of Preston centre, women’s football training, and a ‘World Café’ hosting an exploration into northernness and ‘Northern Grit’ with practical philosopher Ayisha de Lanerolle. With butter pies and parched peas laid on, of course. The station will become a battlefield as political parties take a physical challenge on the station ramp as ‘Cardboard Sumo’ and there’ll be an LGBT discussion and film screening. There’ll also be an intimate sharing of Andy Smith’s much-anticipated new theatre piece The Preston Bill, co-commissioned by TheyEatCulture and Fuel. 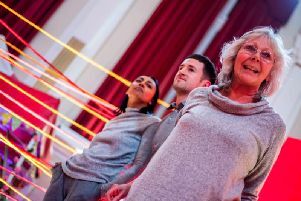 Andy, an award winning theatre maker, spent weeks in Preston as research for this piece, which premieres fully-formed at The Continental in October. On Sunday, the final night, the completed Manifesto for Preston will be revealed, followed by a closing party fuelled by Industraoke! You’ll just have to head along to find out what that is. For the duration of the Oasis Social Club’s stay on the station, the whole process will be filmed and then edited to create a documentary. The Oasis Social Club is merely the tip of the Hit the North iceberg. TheyEatCulture’s founder and creative director Ruth Heritage said: “Hit the North is a way we can bring people in Preston, and audiences from outside the city, together to talk about Northerness, and the regions, at this post-election moment. “It’s a way of opening up debate through artist and cultural activist residencies, production, and new commissions that hopefully reflect our Preston life. The project will continue at the train station and beyond. See next week’s LEP for updates on the event.